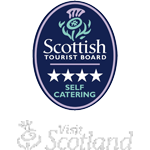 If you’re looking for a high quality, exclusive, traditional and spacious self catering apartment in Glasgow, then Queen Margaret Self Catering Apartment in the heart of Glasgow’s west end offers a traditional Glasgow holiday apartment rental with modern facilities. Situated close by the famous Glasgow Botanic Gardens and sitting in a traditional Victorian apartment block, Queen Margaret Self Catering Apartment is only 3 minutes walk from Glasgow’s cosmopolitan and vibrant west end. Queen Margaret self catering apartment has 4 large bedroom, Living / Dining room, Dining Kitchen, 3 Bathrooms, two person sauna, storage area and holds from 2- 8 people with a flexible bed layout. Our Glasgow Holiday apartment is large enough to comfortably host families wedding parties and holiday groups, yet the apartment has the quality, warmth, intimacy and wow factor to provide a romantic Glasgow holiday break for couples, who can utilise our master bedroom with en-suite and sauna. We cater for holiday makers, city breaks and corporate guests and provide short term or long term Glasgow vacation rentals and corporate rentals. As a family run business, you receive personal attention and a warm welcome and it’s our intention that you feel at home when you stay with us. The bedrooms are decorated in a High Quality traditional manner using Solid Wood furniture, King or Super King beds, fresh decoration and modern technology including Cable TV and free Internet / Wifi. All linen, towels and electricity is provided free of charge.